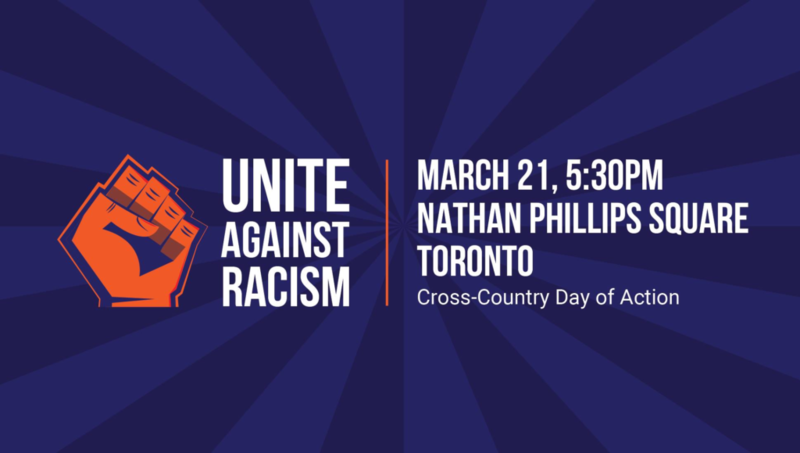 Toronto: #Unite Against Racism action taking place this Thursday, March 21st at Nathan Phillips Square. This action is being coordinated by the Migrant Workers Alliance for Change. On March 21, the International Day for the Elimination of Racial Discrimination, we are celebrating the power of communities and saying no to racism and xenophobia in Toronto (and beyond). The action in Toronto is a part of a series of actions taking place across the territory. We know that migrants and refugees are being displaced in heightened numbers globally. In Canada, anti-immigrant protests and racially-motivated attacks are on the rise. Politicians are using anti-immigrant and racist rhetoric to garner the support of thousands. We need to come together and align ourselves with a clear, anti-racist, migrant justice vision. We need to join the call to #uniteagainstracism and demand justice for all. Status for all, status now: Permanent resident status and family unity for all migrants and refugees on the territory, landed status upon arrival in future and no detentions or deportations. Decent work and fair wages: A $15 minimum wage, full labour rights, and no closed permits. Access for all: Universal access to public services including healthcare, education, income security, settlement services, childcare, and more. Just society: Indigenous self-determination, gender justice, and an end to racism, including anti-Black racism. No displacement: An end to practices of displacement and persecution that force communities to move including climate change, wars, and economic exploitation. Attendees are encouraged to bring a pair of shoes that represents migrant and refugees crossing borders, working in the fields, shops and homes, living in fear, facing exploitation and police violence. They could represent your own experience or someone you know who has faced struggles in work and migration. The shoes will contribute towards an action that will take place at the rally.